Something to note is that the apartments aren't all that private, since their walls are quite low, and most any adult standing up will have a view of the interior of your apartment, if they look your way. Similarly, don't count on any noise insulation, although fortunately, on our night flight from Sydney, it was very quiet and conducive to sleeping. 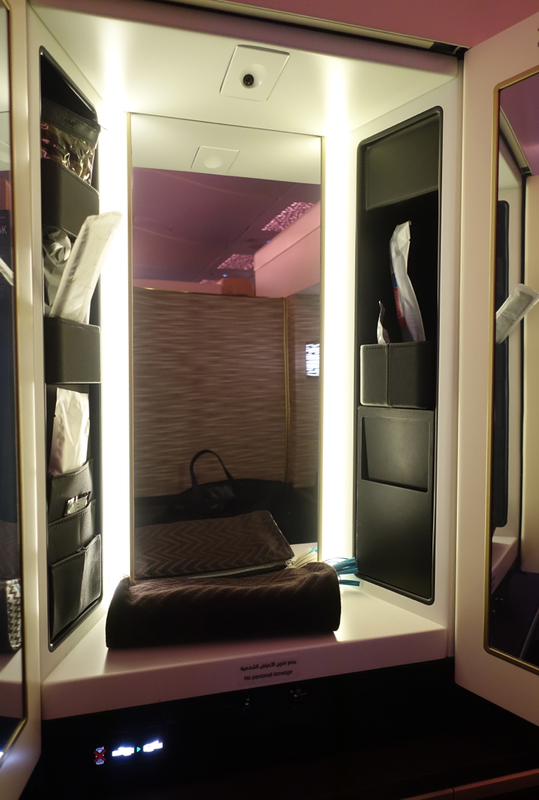 Next to the seat is the vanity, with mirrors and amenities in the mesh pockets, as well as the amenity kit bag. It is handy to have a good size mirror in the suite, since in other first class cabins I've seen at most a small mirror. And men will no doubt appreciate that women passengers who wear makeup can apply it in their suite, instead of taking up a bathroom to do this. 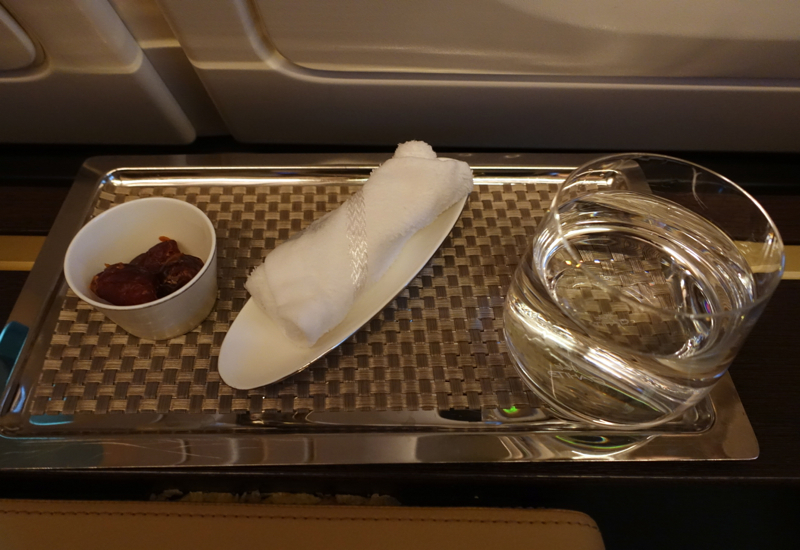 Note that Etihad's amenity kit is less elaborate than most first class amenity kits–it has all the basics, such as a toothbrush kit, earplugs, comb, and Le Labo Bergamote 22 products, but you won't find elite skincare such as SKII (Qantas First Class) or Shiseido (JAL First Class) or Bulgari products (Emirates First Class). 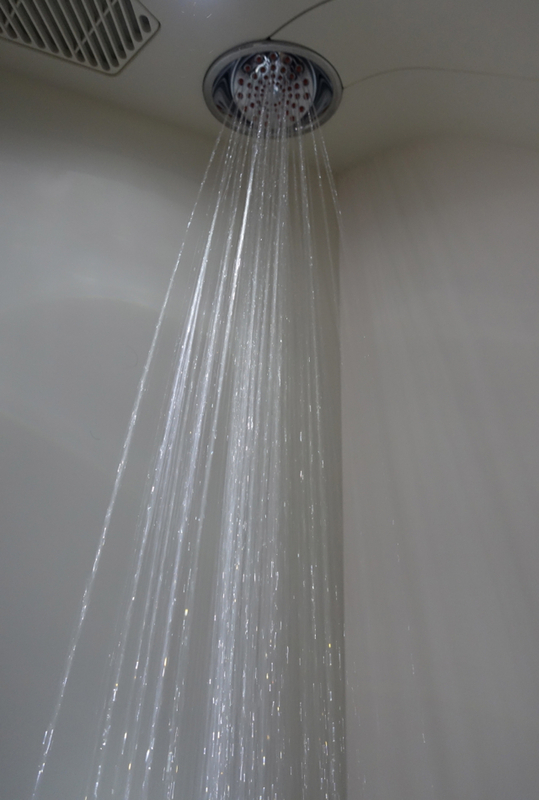 With the A380, Etihad became the second airline, after Emirates A380 First Class, to offer an onboard shower to Etihad First Apartment passengers (Etihad The Residence passengers enjoy a private shower). The shower is in one of the two first class bathrooms, and is quite small, compared to Emirates. 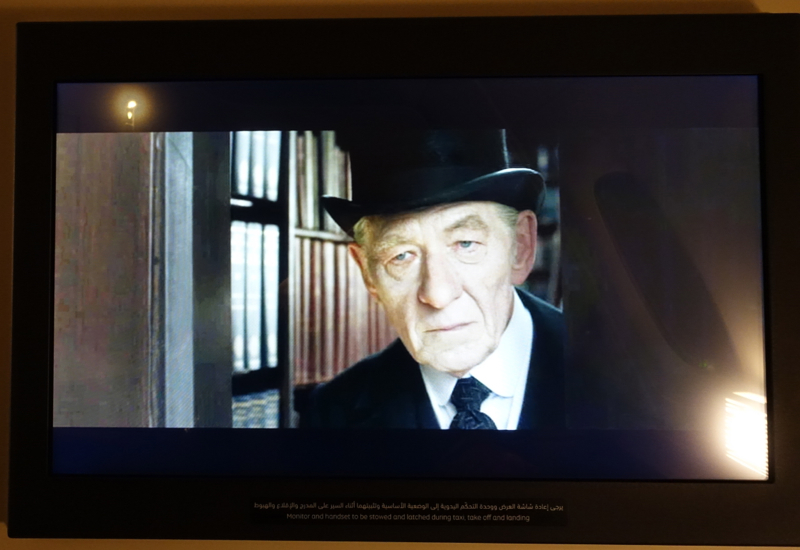 Still, it was exciting for both my 8 year old and I to be able to try out this feature on our first flight in Etihad First Apartments. And a side benefit to having a shower midway through the flight is that the humid air really helps combat the dry air's effect on your skin and sinuses. 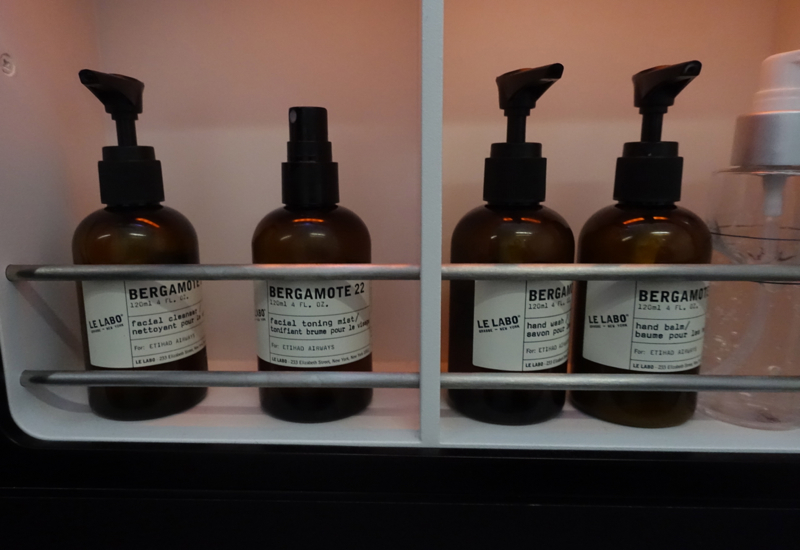 After we advised one of the flight attendants of wanting a shower, it was prepared, with a towel left on the towel rack, a bath mat, and Le Labo bath products. 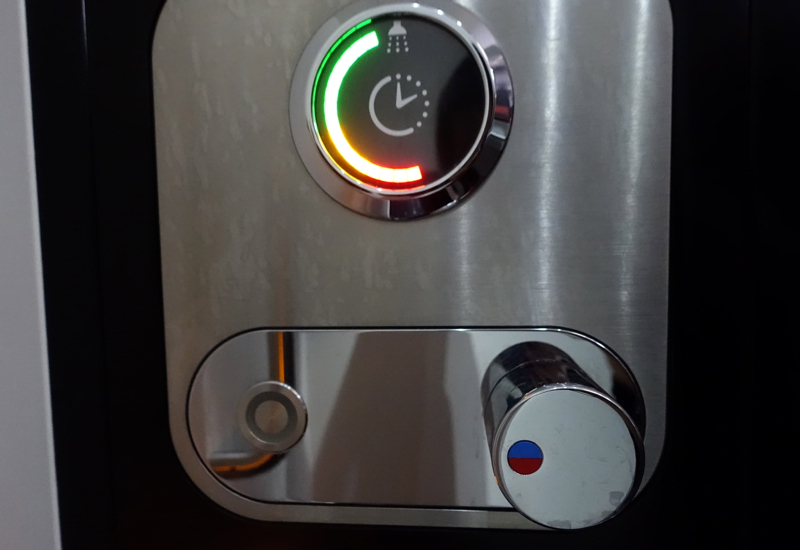 The shower height was fine for me and of course for my son, the water temperature was easily controlled and consistent, and I didn't even need the full 4 minutes allocated. After my son woke up, we had a meal together. 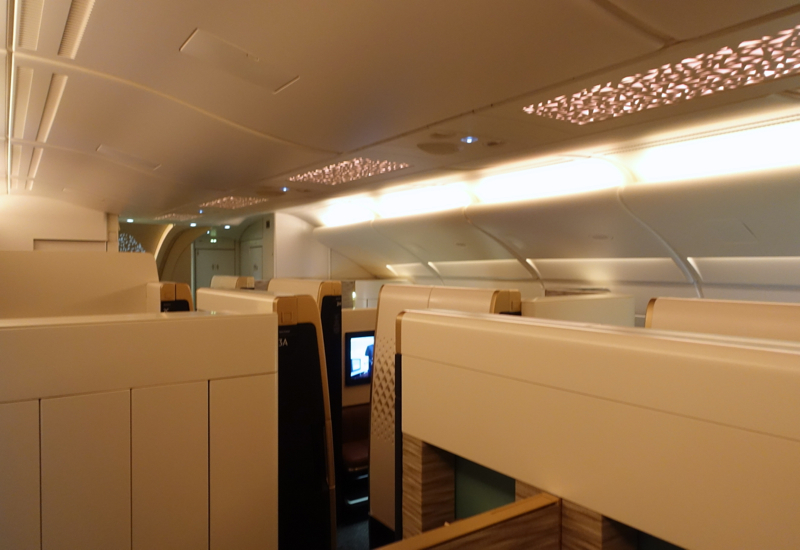 As with most first class cabins (except Emirates) it's possible to sit across the table from each other, one person in their chair and the other on the bench that becomes the bed. 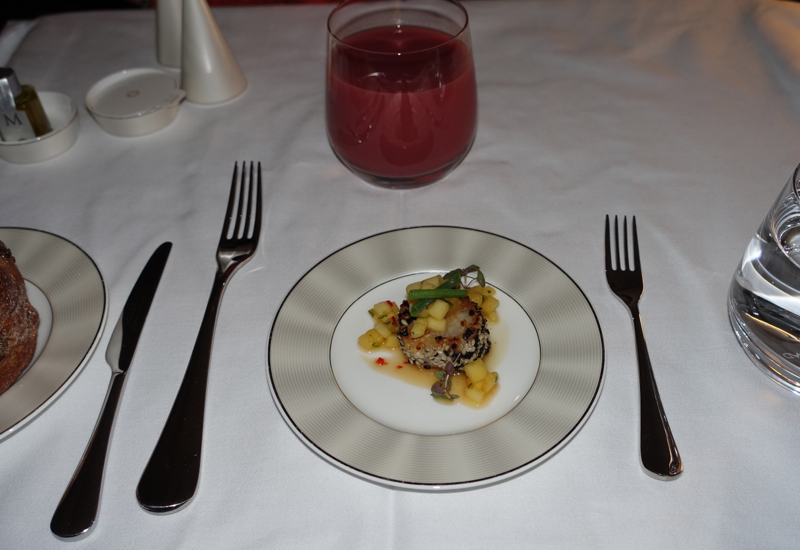 We started out with a cranberry and raspberry smoothie and a sesame crusted seafood amuse bouche with mango, both of which were delicious. 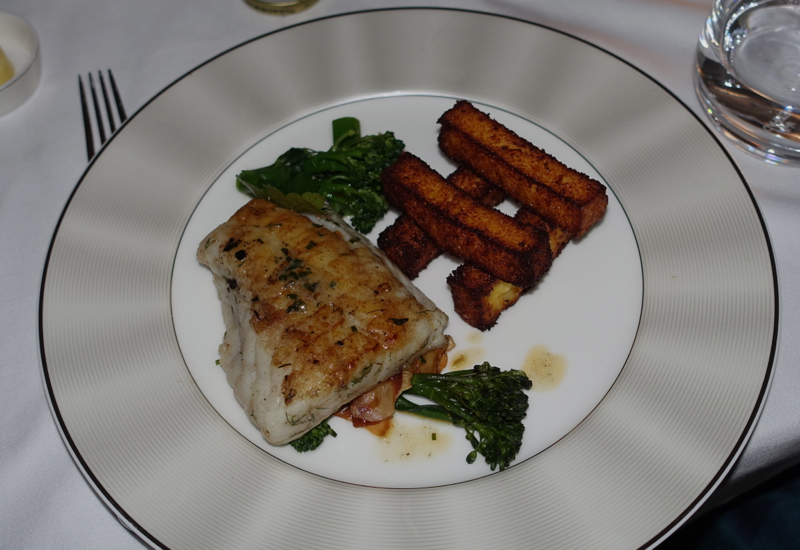 I'd asked the chef to save me his seafood special of the day, a grouper baked en papillote, with baked polenta chips. The grouper tasted great, although it was somewhat tough and hard to cut due to the preparation. 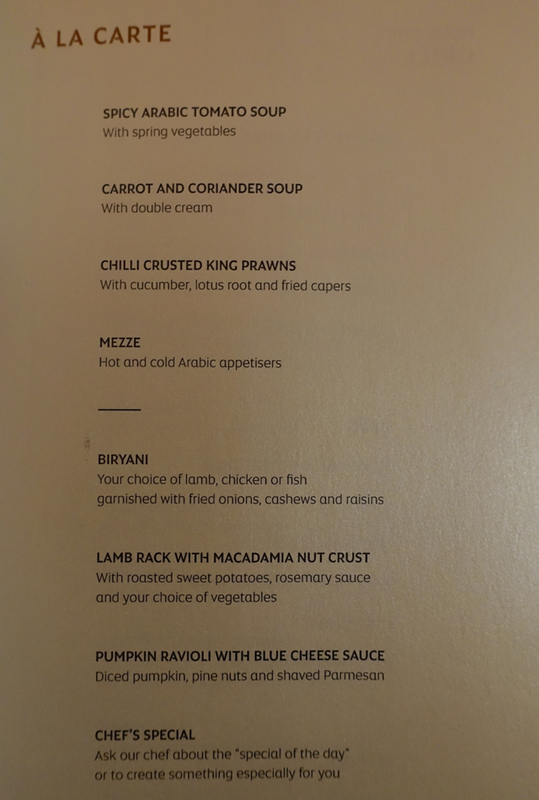 So Etihad may want to nix the en papillote preparation style, although I do give points to the chef for how ambitious this dish was. My son felt like breakfast food, so he enjoyed some thick and creamy plain yogurt that we mixed with jam to make fruit yoghurt. The only problem was that the Hero jam container we were initially given had already been partly consumed, so we got a fresh, unopened one from an attendant in the kitchen, who was very apologetic. 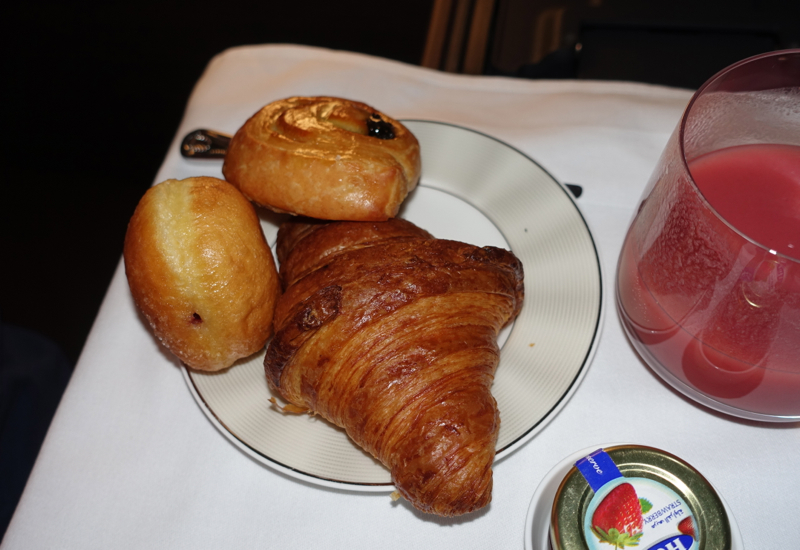 There were also breakfast pastries, which were surprisingly good for onboard pastries. 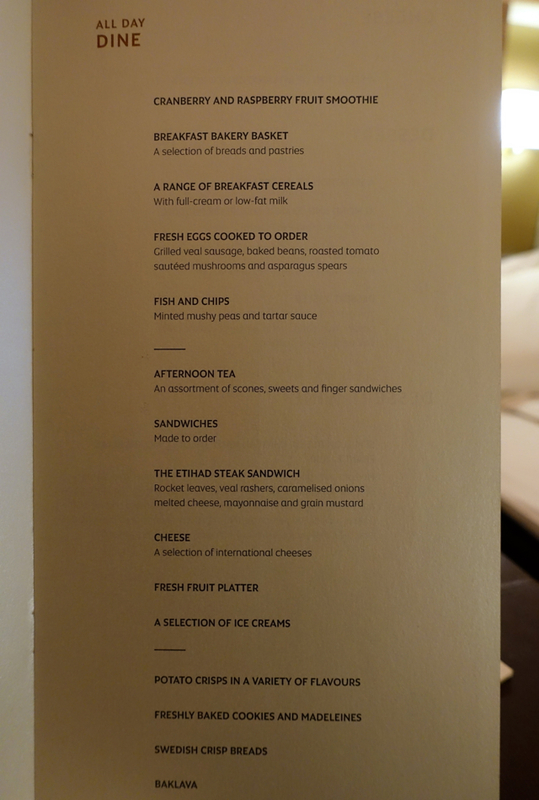 I do wish that Etihad would use better jam, however–something such as d'arbo, instead of Hero. 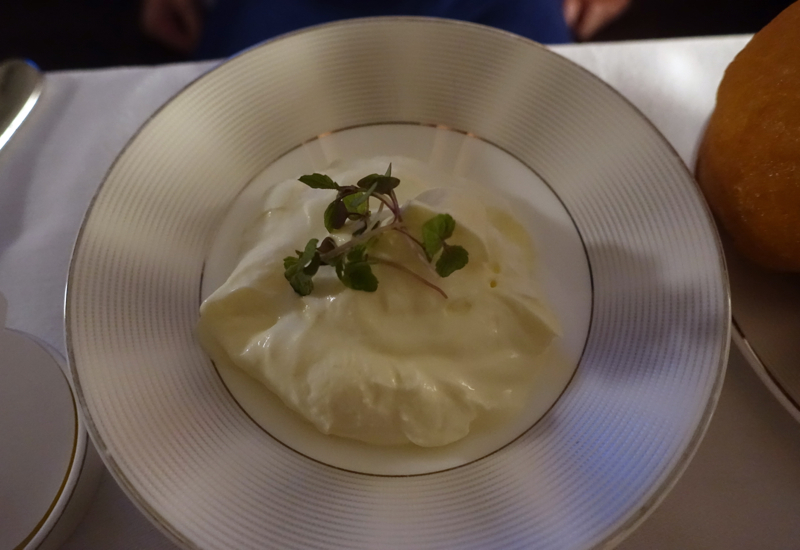 The highlight for me was the Almond and Orange Flourless Pudding, for dessert. 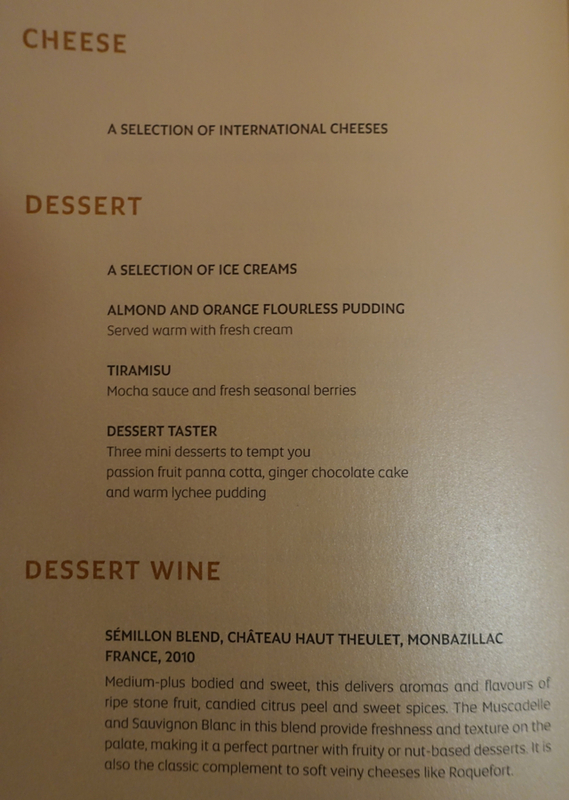 This was really excellent, better than the desserts we'd had in the Etihad Lounge in Sydney. And my son took a break from his homework to watch a kids' show. 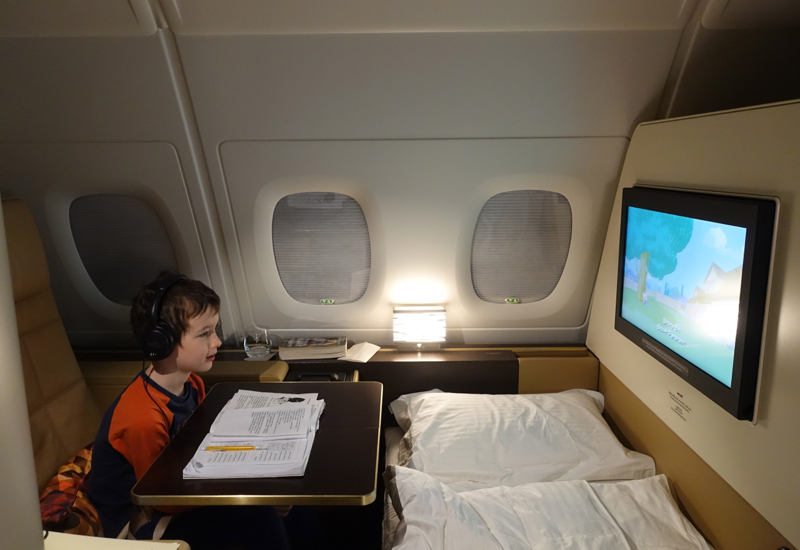 While we're pretty strict parents at home, as a no TV, no iPad household, we let him watch quite a few kid-friendly shows on flights, as long as he gets his homework done. 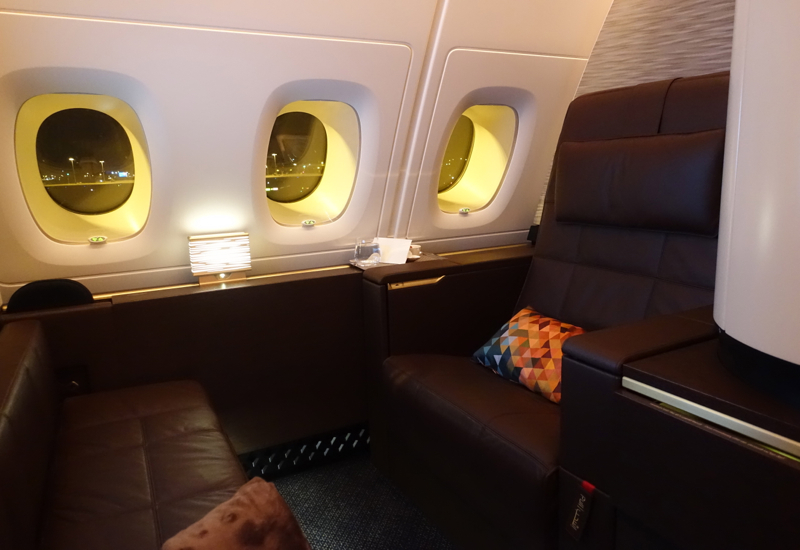 Since we were on a night flight, the attendants were kind enough to make our bed even before the flight took off, even though of course we were seated in our respective seats for take-off. 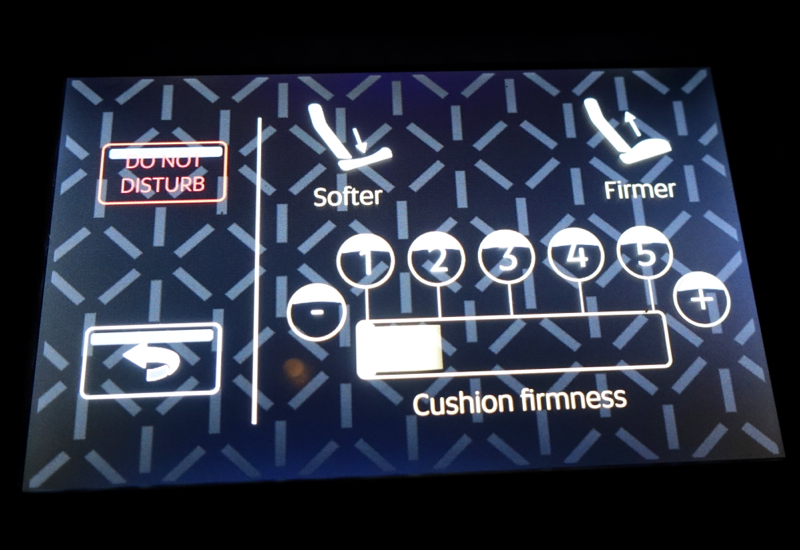 The bed is made with a mattress pad and duvet, although isn't as well padded as either Singapore Suites on the A380 or JAL First Class or even JAL Business Class. It is however nice and long, at 80 inches. Similarly to my husband, I opted to switch the bed around to have the pillow close to the window. The way all the beds are made is with the pillow right by the aisle, making it harder to sleep if you're sensitive to footsteps and noise in the aisle. My son slept well–he sleeps well almost anywhere if he has a horizontal surface and it's somewhat dark. I'm a light sleeper, so I didn't sleep quite as well, particularly since the bed isn't as comfortable as my bed at home, but I probably got 2-3 hours of sleep plus some rest. 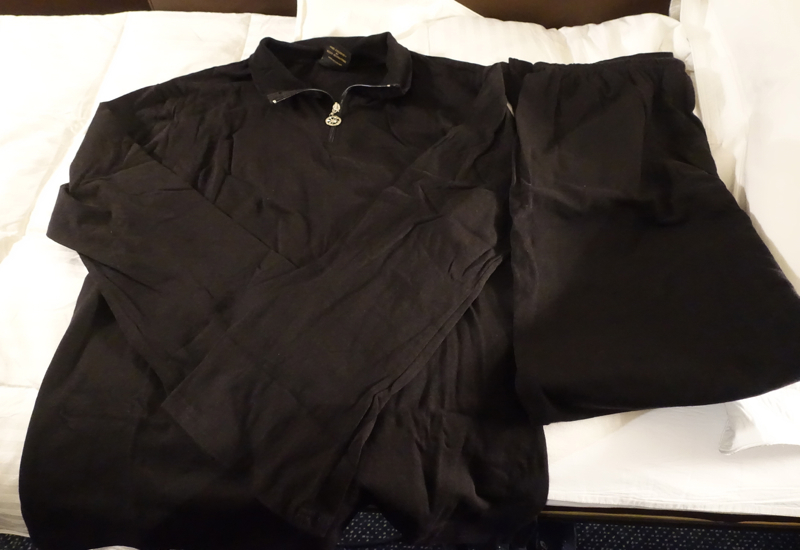 One of my favorite aspects of Etihad's soft product are the women's pajamas. 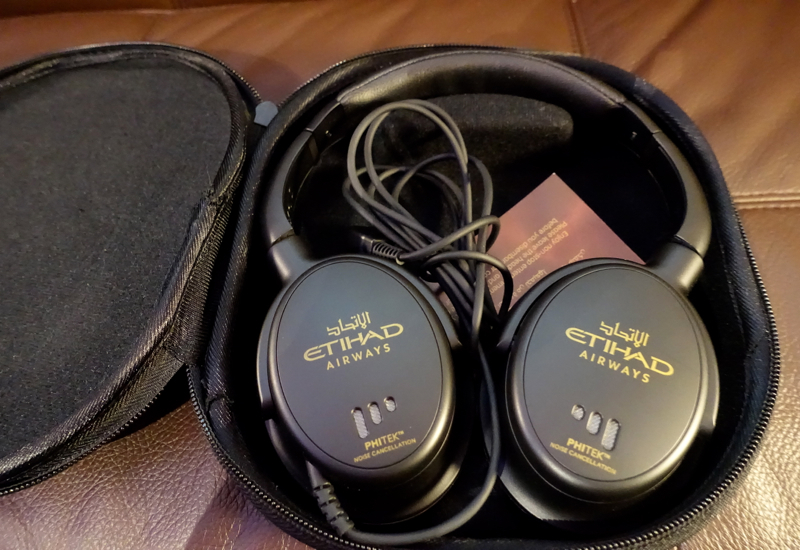 While my favorite pair remain the ones with Swarovski crystals on the zipper from my first Etihad First Class flight, which are truly elegant enough to wear as an evening top, the current ones are still quite nice. The arms flare out a bit at the wrist, and the tunic style top has quickly become a favorite among all of my various airline first class pajamas. 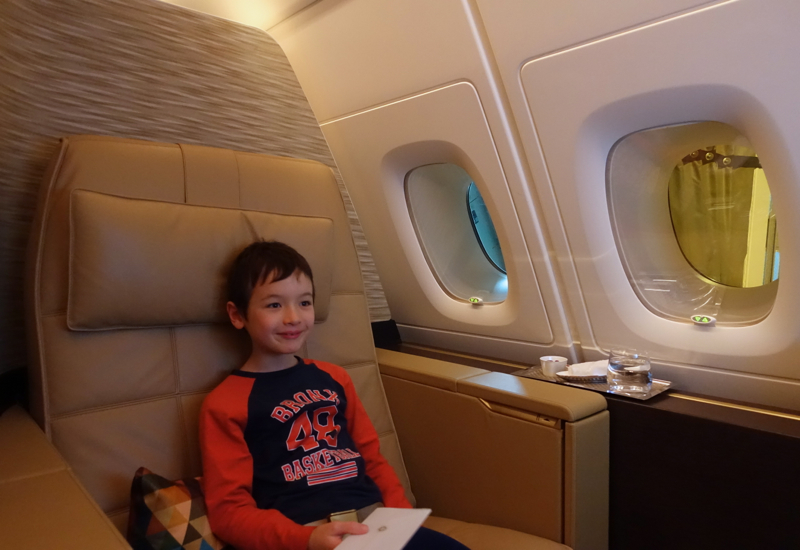 Etihad First Apartment on the A380 was a great experience for my son and me, with several things we liked more than other first class products, as well as a few things we liked less. It's great having a separate bed that can remain as a bed for just about the entire flight, rather than having to turn your seat into a bed and back again. That said, the sleep quality itself, at least for me, wasn't as good as on Singapore Suites or JAL, both of which offer thicker, more comfortable mattress pads. 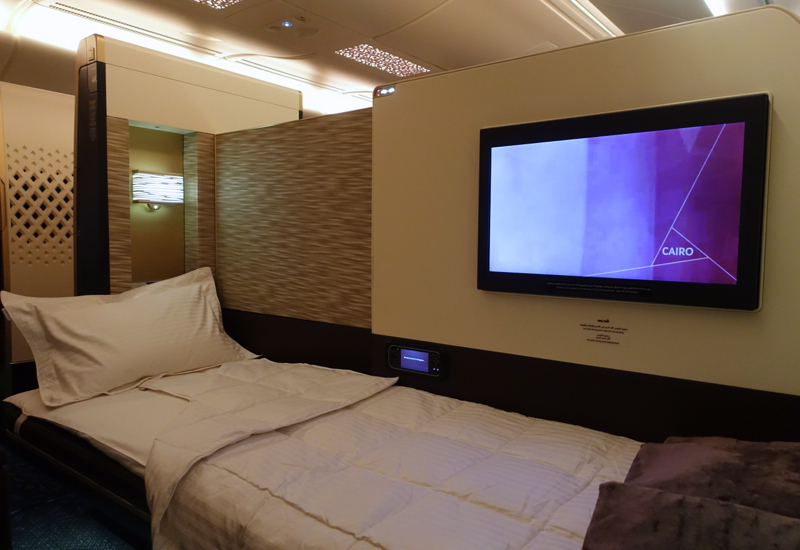 If Etihad was to add similarly comfortable mattress pads, it would unquestionably have the best first class product out there. 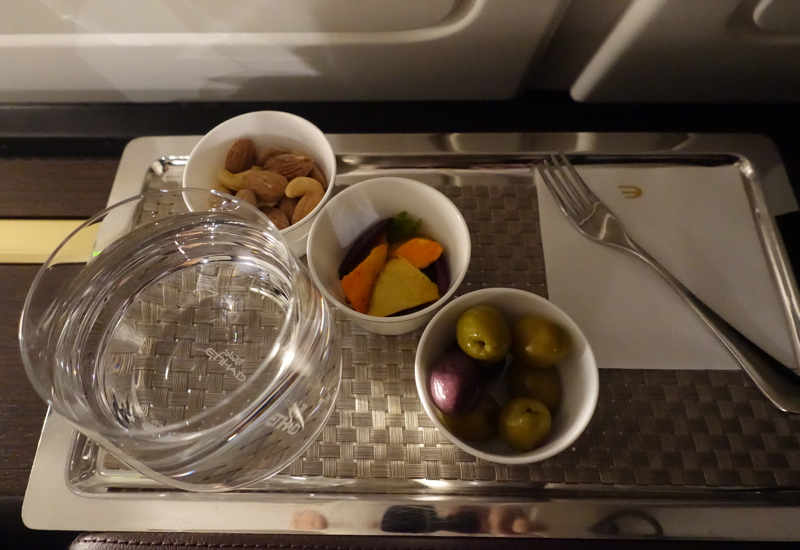 Food was somewhat hit and miss on this particular flight from Sydney to Abu Dhabi. 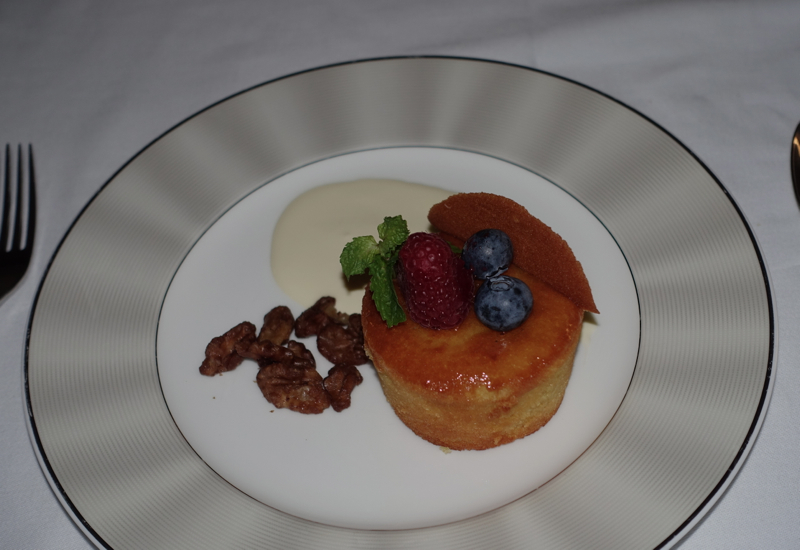 The dessert was stellar and we both enjoyed the smoothies, and I also give points for the onboard chef's creativity and attentiveness, even though the actual dish wasn't as good as I'd hoped for, mainly due to the constraints of onboard cooking. 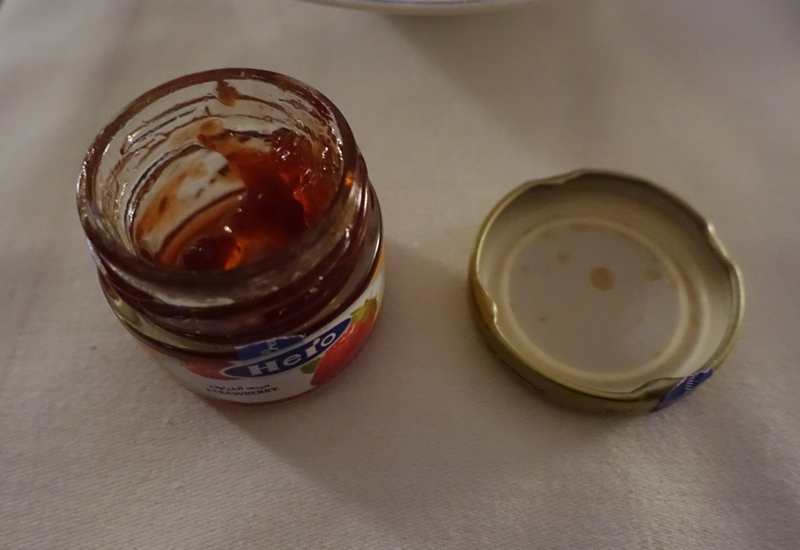 And there was a rare miss in terms of the already opened jam. The shower obviously suffers by comparison with Emirates, which has a spacious shower room, but let's remember that these are the only two commercial airlines with showers, so it remains a great perk in my view. Service was excellent on the flight, from our initial welcome to the friendly onboard chef to the above and beyond assistance of one of the flight attendants who helped my son with a few questions he had when doing his Russian homework that I wasn't able to answer. I always love listening to all the languages the crew speaks, and since Russian was one of them, I checked with one of the First Class attendants if the native Russian speaker might have time to help with the questions my son had. Sure enough, after meal service for Economy was completed, the Russian speaking flight attendant came over to answer my son's questions, which we were very appreciative of. 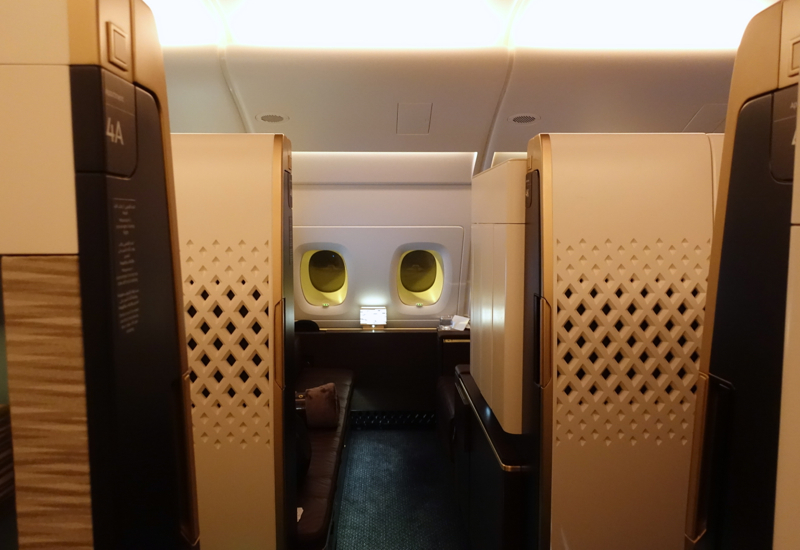 If you've flown Etihad First Apartment on the A380, what was your experience?